American painter. The grandson of Pieter Vanderlyn (1687-1778), a portrait painter active in the Hudson River Valley, he manifested an early talent for penmanship and drawing. During his late youth he moved to New York, where he worked in a frame shop and studied in Archibald Robertsons drawing academy. His copy of a portrait by Gilbert Stuart brought him to the attention of that artist, with whom he then worked in Philadelphia. 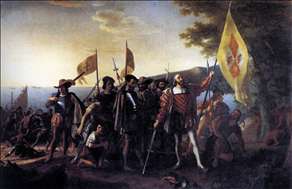 See more details about "Columbus Landing at Guanahani, 1492"